Using a tactic known as a watering-hole attack, the group used a previously unpublished exploit in Microsoft’s Internet Explorer 10 to seed malware onto computers visiting VFW.org through an open iFrame window in the background. “Based on the targeting preferences, we suspect the attacker was looking for intelligence located on US military personnels’ systems,” said FireEye’s Darien Kindlund. If the visitor had any sensitive information elsewhere on their computer, that data would be exposed to the attackers. 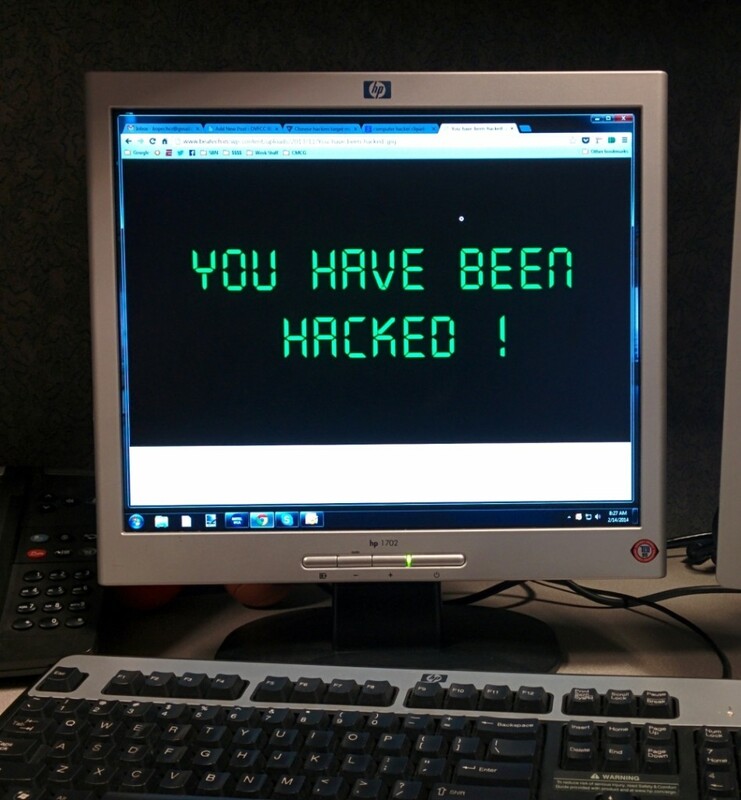 If you frequently visit the VFW Website, please be aware of this technology threat. And stay tuned to the OVFCC blog for updates on when the problem will be fixed. 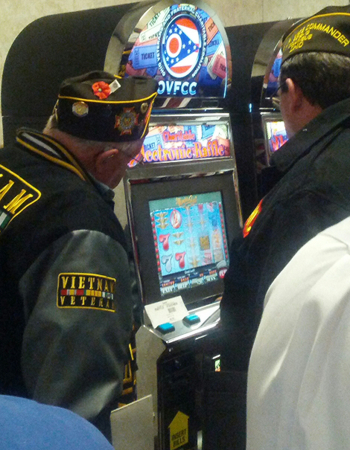 One of the most important factors in Ohio House Bill 325, the bill that would clarify electronic charitable gaming in Ohio, is what these machines mean to the veterans and fraternal organizations that use them. In fact, many proponents of HB 325 claim that shutting down the machines will only serve to shut the doors at the posts and locations for good. One location that could be affected in such a way is the Wellington Eagles Club. The club, which has six OVFCC machines, fears that without their continued use their club and others will be in “dire straits”, according to the Elyria Chronicle-Telegram. While the club was recently raided by the Ohio Liquor Control Commission, a successfully filed temporary restraining order has returned the machines to the club, which has raised over $50,000 for charities since 2011. Douglas, attorney for fraternal and veterans organizations including the Wellington Eagles, said the machines are also different from those at Internet cafes because they issue tickets to the game player, and the tickets are placed into a pool. Douglas contends that Wellington Eagles gaming terminals are legal under Ohio Revised Code 2915.092, which regulates raffles conducted by charitable organizations. By definition, Wellington Eagles is considered a charitable organization because it donates more than half of its proceeds to charity, he said. Hopefully, with the passage of HB 325, clubs like the Wellington Eagles won’t have to win court battles to continue their generous charity efforts. Following yesterday’s opening sponsor testimony on HB 325, The Columbus Dispatch reports that the legislation currently before the Ohio House of Representatives would make the preferred method of fundraising for veterans and fraternal groups legal in the state, allowing organizations to keep their doors open. The legislation, which is currently moving through the Ohio House, still needs to go through proponent and opponent testimony, before being voted on, sent to the Ohio Senate and then to the desk of Ohio Governor John Kasich. Veterans and fraternal groups are engaged in an ongoing fight over their ability to run electronic gaming machines. They packed a House committee room, and many are eager to return to testify in favor of House Bill 325. On Oct. 16, Attorney General Mike DeWine ordered members of the Ohio Veterans and Fraternal Charitable Coalition to stop operating what he says are illegal slot machines. In December, Franklin County Common Pleas Judge Laurel Beatty granted a temporary restraining order allowing the machines to remain operational. In November, veterans posts and fraternal lodges rejected an Ohio Lottery Commission offer to place 1,200 electronic gaming machines in their establishments. The six statewide groups argued that the deal would not provide them enough to cover operating costs and charity payments. The groups prefer to see the legislation pass. For more information, please continue to check the OVFCC Blog for the latest coverage of Ohio House Bill 325. The introduction of House Bill 325 in the Ohio Legislature marked an important first step for Veterans and Fraternal Organizations, who seek to clarify existing law regarding electronic charitable gaming. Since the Bill was introduced by Representative Rick Perales (R-Beavercreek), the next step was to hear testimony from sponsors, proponents and opponents of the Bill. The first of those testimonies began today at the Ohio Statehouse. 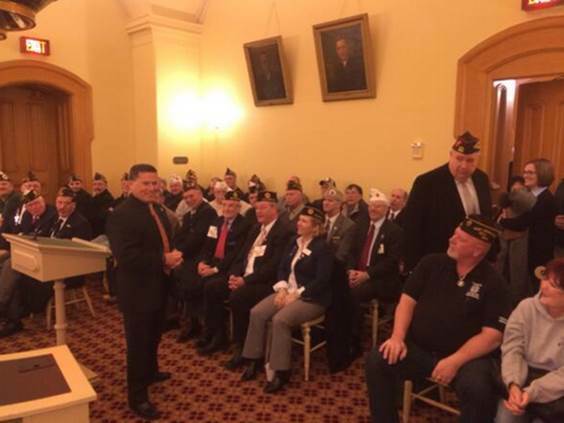 Before a packed room of veterans and fraternal organization members, Representative Perales delivered his supportive testimony in favor of HB 325. While there are still many things that must happen before the Bill eventually ends up on Governor John Kasich’s desk, this is an important first step. Representative Perales’s testimony is presented below. The OVFCC applauds Representative Perales and all supporters of HB 325. Please stay tuned to this space for all information about HB 325 and the OVFCC. Thank you, Mr. Chairman, and members of the committee, for the opportunity to present House Bill 325. Veterans and fraternal organizations in this state play a vital role in our communities. They provide a place of community for our returning warriors, they help veterans in need of a hand, and they support local charities that are so vital to people of this state. These organizations help homeless veterans pay for housing; they pay for furniture and appliances for families of active duty men and women who need a little help to make ends meet; they pay for burial costs of veterans and family members who can’t afford it; they build decks and wheelchair ramps for disabled veterans so they enjoy the simple pleasure of spending time outside and breathing fresh air; and they help fund veterans affairs claims agents who literally help bring hundreds of millions of dollars back to Ohio’s veterans in the way of federal grants. They help children with learning and developmental disabilities. And all this doesn’t even begin to describe all of the work they do in our communities. For years veterans and fraternal organizations have been permitted by Ohio law to raise funds to support their organizations and local charities through paper forms of bingo. However, as technology has improved and video gaming is become prevalent in Ohio, many of these organizations are struggling to survive with a diminished interest in paper forms of bingo. A number of posts in this state have been forced to close and many are in immediate danger of closing. Several posts in this state currently have their properties up for sale because they are unable to generate enough revenue to support their organizations….all because they have been unable to keep up to date with more modern and entertaining forms of charitable gaming. The Attorney General already regulates paper forms of charitable gaming. House Bill 325 has been approved by the Attorney General from a regulatory perspective. It gives the Attorney General authority over a centralized “Report Management System” which runs the entire gaming system and maintains all financial data, and requires all gaming devices and terminals to interface with the system. This will ensure all funds are tracked and accounted for in a transparent way. This will also ensure that charitable contributions are made to designated 501c3 charities. The bill also gives the Attorney General the authority to license multiple vendors based on stringent criteria and requires video gaming supplies to be tested by a laboratory certified by the Ohio Casino Control Commission and the Ohio Lottery Commission. And finally, the bill sets limits on the number of video gaming terminals allowed per location based upon membership. House Bill 325 would give veterans and fraternals a legal, accountable, transparent and charitable mechanism to continue raining funds and providing the great service to our communities. I encourage all of my colleagues on this committee to support HB 325.